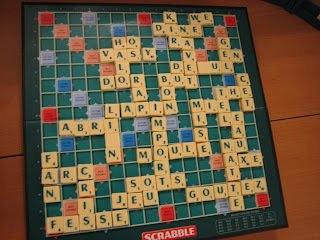 I lost this weekend's Scrabble game by a good 45 points. I don't play Scrabble very often. To be honest, I never did, except when Nana would visit and the game was only half of the activity. We'd usually end up making long lists of words well after the game was over. "Let's see if we can think of words that start with E", she'd say and we'd sit around eating Chex Mix while we listed words off the top of our heads. The Scrabble box at home is filled with these handwritten word lists, as well as score sheets that go back years. Once in a while you'll see a "D" or "M" among the scores if my parents decided to join in, but Scrabble and Chex Mix was really a time for Nana and the kids. Nana won't be spending Christmas with us this year because she's been moved into a nursing home for patients with Alzheimer's. She was pretty forgetful this summer when I saw her and only recognized me part of the time, but from what I hear through the family grapevine, she now has a hard time recognizing most of the family. Others now makes lists for Nana: names of her grandkids, names of her children, even sheets of paper with her own name and room number to remind her should she get lost. I'm impatient to get home and enjoy the Christmas family traditions like Scrabble, though it will be really strange to not have Katie home this year. I just sent off a 4th holiday package to Togo in the hopes that some new things will give her a taste of home. Buying gifts for her this year reminded me of when we were younger and my family would sponsor a homeless family or child in a foster home. We'd get the label, "girl, 8 years old, likes drawing" or "boy, 15, wants gloves and a hat." They never wished for complicated things like the newest video game or an Elmo doll, but those were exactly the things we wanted to get them. I remember wanting to go above and beyond what these kids wanted, precisely because they couldn't wish for these things themselves. In some ways, buying gifts for Katie this year was my most fulfilling holiday shopping because I know how much every gift means. If you're interested in doing a feel-good something for the holiday season, here's a link to Toys for Tots, an organization that I support every year. I usually pick up some coloring books and crayons or play dough, but they obviously accept any toys you'd like to buy. If the TT stand is still up in the mall when I get home this weekend, I'll be sure to drop by and make a donation, something that promotes families getting together. Maybe a Scrabble game or two.